After starting last week rising quickly, interest rates rebounded near the end of the week. The Mortgage Backed Security market closed the week trading up + 28 bps, and also closed Monday up + 30 bps. This market is very interesting because negative economic reports are taken as possibilities that the FED will take longer to slow the stimulus. Everything is related to the FED and will be until a taper actually happens. The last few economic reports came in weaker than expected, causing some to believe that the FED will take longer to taper the stimulus because the economic growth targets are not there yet. One of the most notable reports came out on Friday – showing new home sales down over 13% from June – showing in very real terms that the higher rates are starting to affect the economy. Can the economy hit projected growth goals with interest rates over 1.25% higher than the end of April? We are starting to see that this is could really be an issue, with the higher rates lowering potential home owner’s buying power, and making it hard for potential borrowers to lower their payment on a refinance. I think we may see some short term rate improvement as most of the economic reports have been lower than expectations. Even with rate improvement, there is only so much rates can go down unless the FED decides not to taper. Huge news from FHA last week, with FHA releasing new guidelines allowing potential borrowers to qualify for a FHA loan only 12 months after a foreclosure, bankruptcy, or a short sale. This is welcome news in the lending community, with many capable borrowers having to wait out periods after economic events such as these. Foreclosures and short sales are especially common in areas hit the hardest by home values dropping far below the amount of the mortgages borrowers financed on the properties. These new guidelines should bring more homeowner’s into the buying pool again, instead of waiting on the sidelines. Hopefully Fannie Mae/Freddie Mac will follow suit. RATES STEADY – WILL FED MOVE CAUSE INTEREST RATES TO RISE IN SEPTEMBER? Last week started off with rising rates, but interest rates improved the last 3 days of the week. Overall, the Mortgage Backed Security Market closed up + 1 bps on the week – keeping rates very similar to the week before. On Monday morning, interest rates were improving when we had a big intraday swing which ended with the MBS market closing down – 25 bps. Much of the swing appeared to be due to the San Francisco chapter of the FED releasing an economic report essentially stating that the FED’s Mortgage Backed Security purchases were not very effective in stimulating the economy. The report indicated very modest GDP growth as a result of the stimulus. In the past week we have also heard over 5 FED members state that the FED needs to taper it’s bond purchasing program. This is a ticking time bomb at this point. All signs point to the FED tapering in 2013. They have FOMC meetings scheduled in September, October and December. I recommend any customers that can benefit from a refinance to take advantage of it before this move happens. When it does, I expect 30 Year Fixed rates to jump into the 5%’s. The FED could slow the stimulus as early as September. 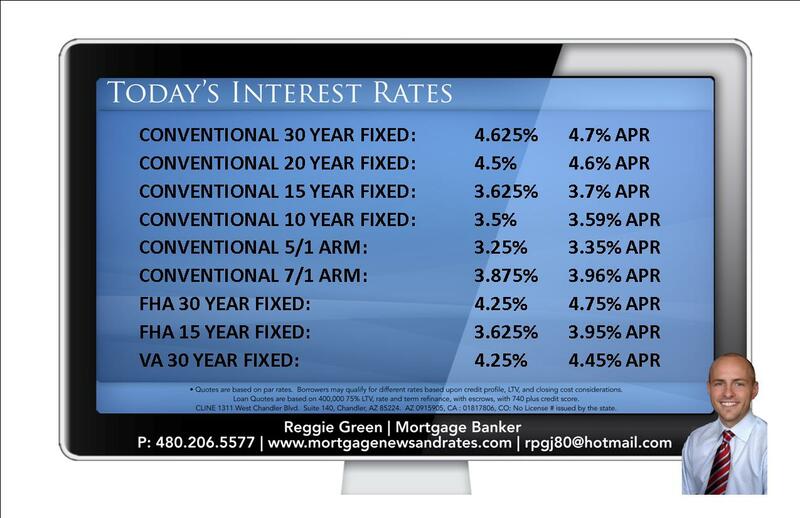 Today’s Mortgage Interest Rates. Current Mortgage Interest Rates and APRs for refinancing and purchasing in Arizona, California, and Colorado. Arizona Home Loans, California Home Loans, Colorado Home Loans. Arizona refinance, California refinance, Colorado refinance. Mortgage Rate Sheets for fixed mortgages, ARM mortgages, Variable Mortgages, Interest Only Mortgages, HARP mortgages, HARP 2.0 mortgages, DU Refi Plus Mortgages, Freddie Mac Open Access Mortgages, Fannie Mae Home Path Mortgage, Freddie Mac Foreclosure Relief Mortgage, VA mortgages, VA Interest Rate Reduction Loans, FHA mortgages, FHA streamline refinance mortgages, Conforming mortgages, Conventional Mortgages, 100% Financing Mortgage, High Balance Mortgages, Fannie Mae mortgages, Freddie Mac Mortgages, No appraisal refinance, 0 point mortgages, 0 closing cost mortgages, paying a point mortgages, Refinance mortgages, purchase mortgages, and Jumbo Mortgages. It was quite a roller coaster week as rates went up for the majority of the week, then took back the losses on Friday. At the end of the week, the Mortgage Backed Security market closed trading up + 8 bps, with the market improving over 100 basis points on Friday alone. The July employment report was the catalyst for the rate improvement on Friday. Non-Farm payroll jobs were below forecasts and the numbers for June were revised lower. Even though the unemployment percentage went down, the lower than expected job growth numbers caused a big rise in the MBS market. Also on Friday, a Fed member stated publicly that the FED would taper it’s bond purchasing program when current economic data supported economic growth, not on the FED’s own internal forecasts. This is reassurance to the market that the FED won’t slow the stimulus based on projections versus real data. Still the MBS market was not able to go above it’s 10 day moving average of resistance. This could mean that traders will not purchase Mortgage Backed Securities over a certain amount, period. 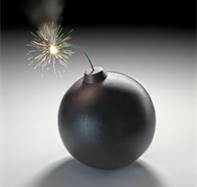 I still think the prospect of 30 year fixed rates improving much past 4.25% are slim, and locking is the best option.